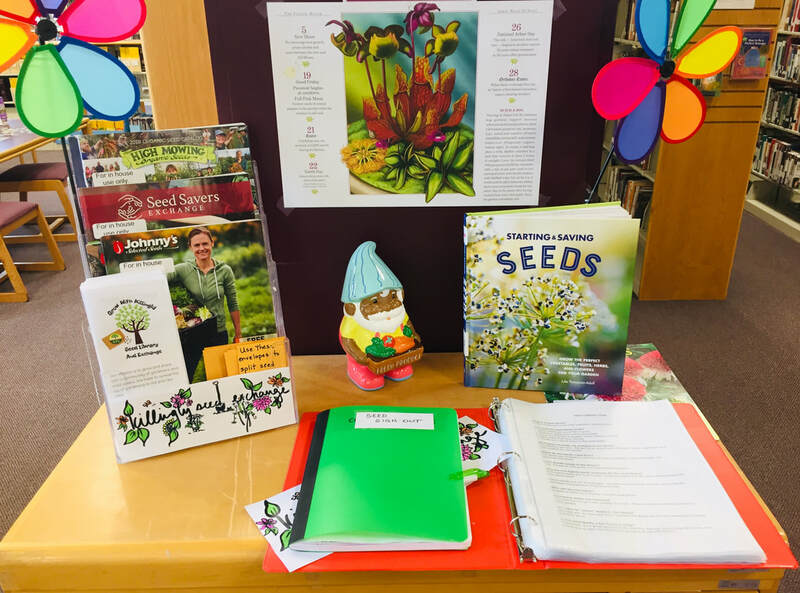 The Killingly Public Library is pleased to present our NEW, community-wide seed library and exchange. Our mission is to grow and share with a community of gardeners and seed savers. We hope to spread the joy of gardening to old and new alike. Our collection of vegetable, flower, and herb seeds are perfect for first time gardeners just breaking ground, and established growers who would like to enhance their gardens or just try something different. All our seeds are sorted alphabetically by common name and have been made available by the generous donations of established seed companies and private growers in the area. In the future we can continue to grow through your seed saving donations. Join us and come check out our collection. Help yourself to some veggies and beautiful blossoms. Seeds are arranged alphabetically and by common name. Additional resources can be found at the bottom of the page and at the library. You may select as many seeds as you need, but are only allowed to borrow 5 packets/envelopes at a time. Packets can be divided, so place any seeds you will need in the extra envelopes provided. After making your selection, make note of how many varieties were taken, and whether you took a partial or full packet of seeds. This is all run through the honor system, so please be considerate of other community members looking to build their gardens. Some of the easiest seeds to grow and save include: basil, beans, carrots, cilantro, dill, eggplant, lettuce, onions, peas, peppers, sunflowers, tomatoes, and zinnias. Check your seed packet and look for labels like open-pollinated or heirloom seeds. These are great for beginners and produce seeds that will eventually produce plants like the ones you planted. Hybrid seeds are the product of cross pollinated plants and the seeds saved will not be true to the parent plant. Avoid saving these seeds. ​We would be happy to add your seeds to our collection to share with the rest of the community. We ask that only seeds from healthy, non-hybrid plants be saved. Seeds will need to be placed in an envelope and labeled with as much information as possible; common name, scientific name, variety, harvester, location of harvest, year, any notes, and growing difficulty. We also ask that seeds be dry and clean upon donation. Once your seeds are dry, clean, and labeled, drop the envelope into our "Returned Seeds" basket. Please do not file your seeds. Seeds are provided at no cost to you thanks to the donations of local gardeners, businesses, and seed companies. We are all committed to making this a community resource that encourages gardening, healthy living, sharing the experiences and expertise that surrounds our agricultural heritage. There are many resources to help make gardening and seed saving less of a mystery. Some seeds can just be put directly into the ground and will have plenty of time to grow, flower, and produce vegetables and blossoms. Check the date to maturity on the back of every seed packet. Some seeds like to be started indoors to have a little extra time to grow before our local frost date, usually around May 18th. Recognize pests easily with SeedMoney Garden Planners guide. See what pests, beneficial insects, and diseases can do to your gardens with tips and tricks on recognizing and treating outbreaks. Urban Farmers Gardening Guide elaborates on topics ranging from scheduling and planning, plant species and diseases, to harvesting, and seeding saving. This guide really has all you need to know.